Crystal River Cruises took an important step toward expanding its growing fleet earlier as the keel was laid for the company’s first two new build vessels, Crystal Bach and Crystal Mahler. During a ceremony at MV WERFTEN shipyard in Wismar, building of the “Rhine Class” luxury river yachts officially commenced. In summer 2017, the two ultra-luxury vessels are set to embark on their maiden voyages along Europe’s mightiest rivers: the Rhine, Main and Danube. In the presence of Tan Sri Lim, chairman of Crystal parent company Genting Hong Kong; Edie Rodriguez, Crystal chief executive and president; and Erwin Sellering, prime minister of the state of Mecklenburg-Vorpommern, the first sections of the six-star ships were ceremoniously lowered into position on keel blocks. 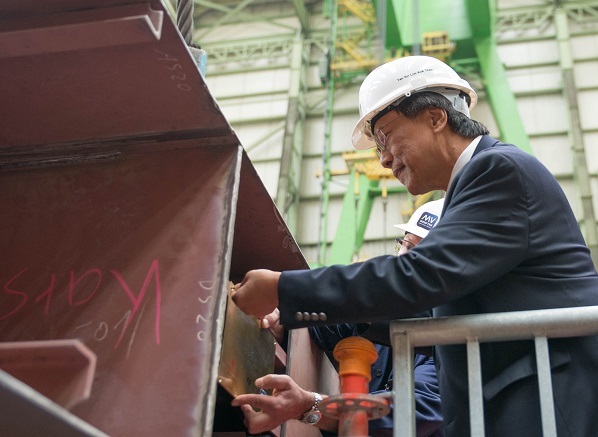 “This keel laying marks an important milestone for us. “These river yachts are not only the first brand new vessels under the Crystal River Cruises brand, but also the first constructed in our very own shipyard,” said Tan Sri Lim. Genting Hong Kong completed the acquisition of the Lloyd Werft ship building yards earlier this year in anticipation of Crystal’s extraordinary brand and fleet expansion, which, by 2019, will see six new build luxury river yachts, the world’s first purpose-built polar class mega-yacht and the first of three Exclusive Class polar class ocean ships constructed at the yard. Rodriguez added: “This phase of the expansion of Crystal River Cruises is in the hands of the expert shipbuilders and designers at MV WERFTEN. Crystal Bach and Crystal Mahler will measure approximately 135 metres in length and 11 metres in breadth, accommodating 110 guests in Crystal’s signature, all-suite luxury.